Senator Harry Reid came clean today. No, not about his Vegas real estate ventures… about Iraq. The Senate’s top Democrat, Harry Reid, offered qualified support Sunday for a plan to increase U.S. troops in Iraq, saying it would be acceptable as part of a broader strategy to bring combat forces home by 2008. 2. The President must understand that there can only be a political solution in Iraq, and he must end our nation’s open-ended military commitment to that country. It’s been two weeks since the Iraq Study Group released its plan to change the course and bring our troops home. Since then, the President has been on a fact finding tour of his own administration — apparently ignoring the facts presented by those in the military who know best. The President needs to put forth a plan as soon as possible, one that reflects the reality on the ground in Iraq and that withdraws our troops from the middle of this deadly civil war. Wow! That is a mouth full, Harry. I’m not sure if you are suggesting that Sandra Day O’Connor and the other ISG members are the military experts the president should listen to in that last paragraph, or not? Because the military came out shortly after the ISG Report was released and denounced it. 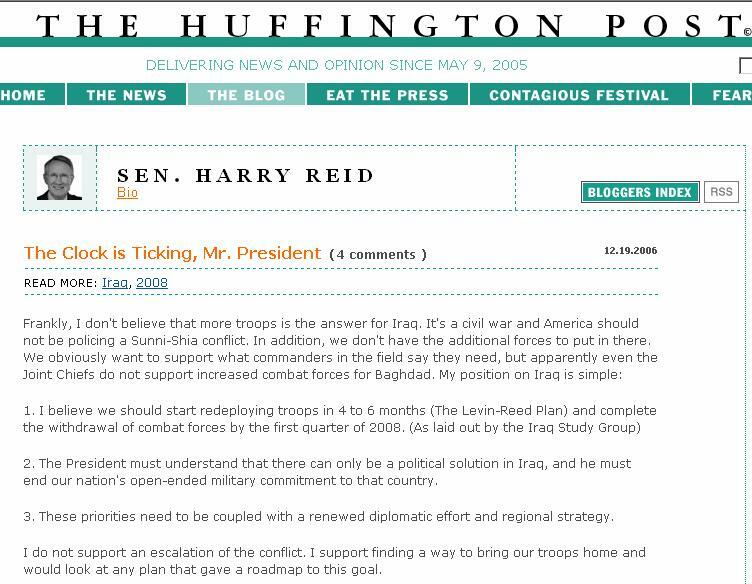 And, it’s nice to see that Harry has joined with NBC with designating Iraq a Civil War. We would expect nothing less. Thank you notorious AP stringer Jamail/Jamil Hussein for your crap reports and thank you NBC for listening! I guess we can all see where this new year is heading! 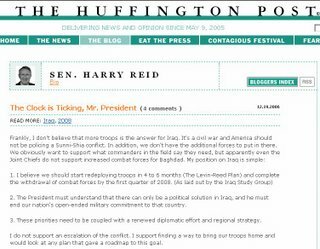 Is it just coincidence that Harry would publish the democrat’s Cut & Run plan on the same day that the new Defense Secretary Gates said that “Failure in Iraq Will Haunt US”? Dan Riehl has more on the back stab. Wilsonizer suggests a study that would enable the US to achieve its stated goals.